Hi everyone, a brief update on my latest work in progress. 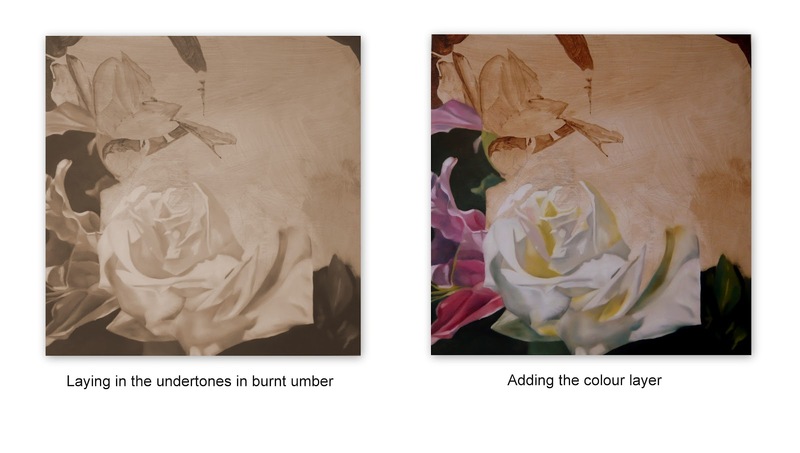 I began laying in my umber layers which place my tonal areas but got so excited about this painting I started laying down colour where I had completed the under tones (just couldn't wait!). Therefore, you are seeing areas of this painting almost complete while other areas are still to have under layers completed. I am thrilled with my progress as I have a gallery very interested in a solo exhibition of my work and need to get this finished so they can see it. I've been working day and night on this piece. You may remember my post on the reference photo that inspired this new work. I chose 5 photos and asked for your opinion. The one I selected was image 3 which was a popular choice. I have slightly cropped the top a little more so the Queen Anne's Lace will not show in my final painting. Thanks Vic, yes its a slow process but your right it does sort of come together like a room. The next layer once the first colour layer is complete is to add "glazes" rather liking adding more colour and depth to a room, then the last layer will be to add my highlights which I lay on more thickly so there is a little texture to them. Overall though my paintings are smooth with just texture in the highlights as I do a lot of blending while building up the colour. Gorgeous!! I'm your newest follower-stop by for a visit!! Thank you Claire and thank you for following, I will drop by and visit your blog. Oh my gosh your art is stunning! Thanks for stopping by BH and for your sweet comment. I look forward to seeing more of your work!